Jim Jakobs stands along West Shaw Avenue. He says this is where he noticed businesses shutting down, and decided to start a group on Facebook to talk about it. 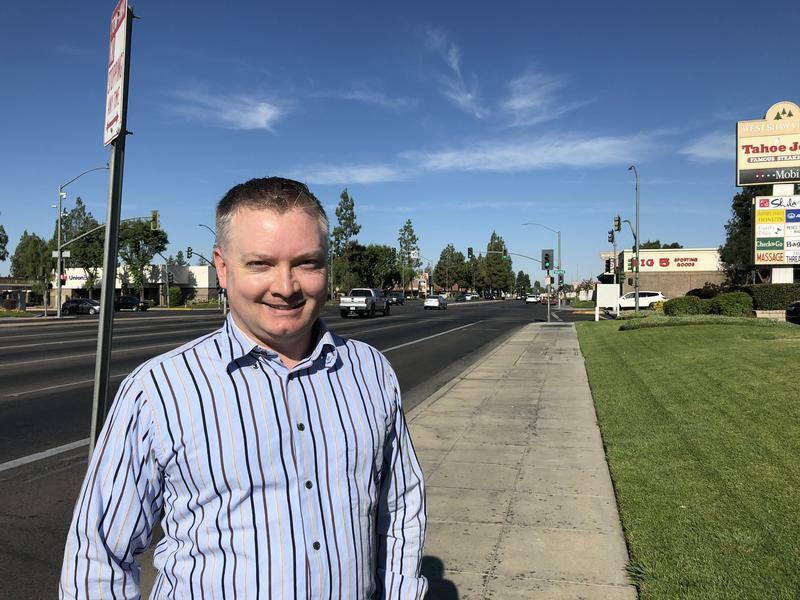 Last week we reported on homelessness in Fresno, and how Mayor Lee Brand hopes his new initiative finds common ground between advocates and organizations. At the same time, a group of neighbors in northwest Fresno released a video urging people not to give out money to people on the street. They say that not everyone with signs are homeless, and giving out money hurts more than helps them. Since releasing the video, the group has received support from city officials, but pushback from homeless advocates. In one parking lot of northwest Fresno, dealing with the homeless is a daily occurrence for Long Xiong. He’s a security guard at the intersection of West Shaw Avenue and North Valentine Avenue. He patrols the parking lot in front of the Broadway Faire movie theater. In the year that he’s watched this particular area, he says that there seems to be less homeless people around. “I mean, they don't do anything bad, but a lot of people don't like them around,” says Xiong. When a client calls, it’s Xiong’s job to ask the person to move along. Xiong couldn’t say whether the change is because of the city’s no-camping ban, which was created last year. But where he feels like the homeless population has gone down, one group of residents has spoken up with concerns that homelessness along this area of Shaw Avenue is growing. Jakobs started the Facebook group, “Save Shaw Avenue” back in February, after noticing that a nearby businesses were shutting down. Jakobs says the idea is to ultimately save Shaw Avenue from blight, and get people excited about bringing business to the area. The group has become a virtual neighborhood watch that focuses on the western region of Shaw Avenue, from North Marks Avenue to Highway 99. A quick scroll through the group shows a number of posts about graffiti and encounters with homeless people. Jakobs says he wants to make the page a place for conversation, but also for education. Last week, the group published an eight-minute long video Jakobs produced, entitled “Save Shaw Ave.” It emphasizes his message that there’s a difference between panhandlers and those who are genuinely homeless. Voices from the Fresno Rescue Mission and the mayor’s office claim that giving out money to people hurts more than it helps. They say the handouts enable people to get by while living on the street, without seeking further assistance. That area of Shaw Avenue straddles the 1st and 2nd City Districts, and both Councilmember Steve Brandau and Council President Esmeralda Soria have expressed support for the group’s enthusiasm. Brandau, who represents the north side of Shaw, has even attended the group’s recent neighborhood cleanup. Brandau says that hearing from businesses about homelessness motivated him to propose the camping ban last year. He adds that homelessness is probably not the only reason for businesses leaving the area. Council President Esmeralda Soria represents southwest Fresno, including the south side of Shaw Avenue. She says that this is actually the first time she’s heard complaints about homelessness from that part of her district. Throughout the city, though, Soria says she wants to see a comprehensive approach to the issue. That seems to be the overall goal of “Save Shaw Avenue” -- find ways to reduce homelessness and improve the area to appeal to businesses. But some homeless advocates, like Mike Rhodes, have pushed back, saying that to dissuade people from handing out money is cruel in itself. “If being cruel to the homeless -- which has been the policy of the City of Fresno for decades now -- if that was successful, homelessness would have been over a long time ago,” Rhodes says. He says that the city and organizations could reduce homelessness just by providing a safe and legal place where people could stay and manage their possessions. Jim Jakobs says that for the most part, the video and group have received positive feedback, but he knows there are those like Mike Rhodes, who disagree with him. For now, one has to wonder if that will be enough to save Shaw Avenue. About a quarter of the nation’s homeless population live in California with most of them concentrated in the state’s larger cities, including Fresno. Governor Brown has responded in his latest budget by including $500 million in grants for cities to address homelessness. Fresno Mayor Lee Brand went to Sacramento to lobby in support of this funding. Despite years of work on the problem, the city’s homeless population is still significant. 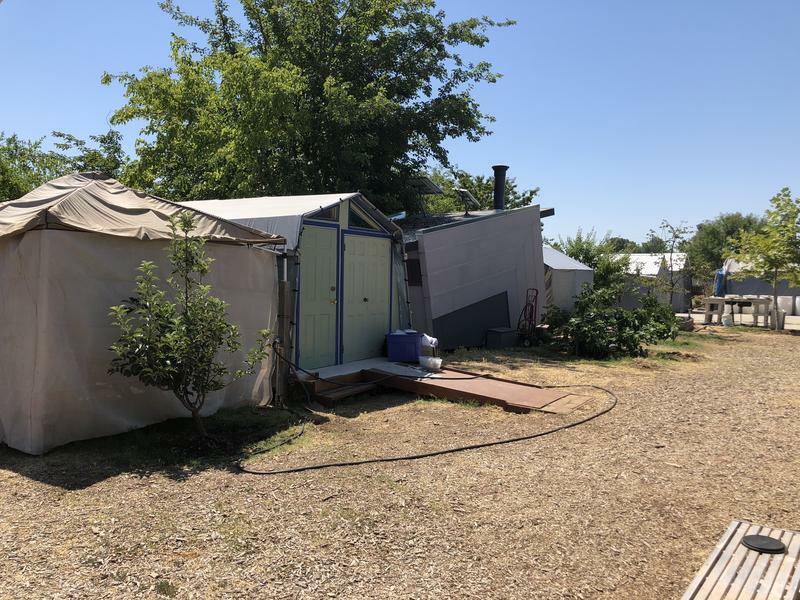 Some have said in recent times that Fresno has spent too much time and efforts criminalizing homelessness, referencing the so-called camping ban. Think for a moment about neighborhoods in Fresno. Maybe you thought of the Tower District, or Fig Garden? Or perhaps it was Woodward Park or Sunnyside. What about the area west of Highway 99, between Clinton, Herndon and Grantland Avenues. Today it’s a checkerboard mix of subdivisions, rural homes, and farmland. And getting across Highway 99 to the rest of Fresno, and over the railroad, and Golden State Boulevard is a traffic nightmare. Now, the city is starting a new effort that aims to solve some big problems for area residents.